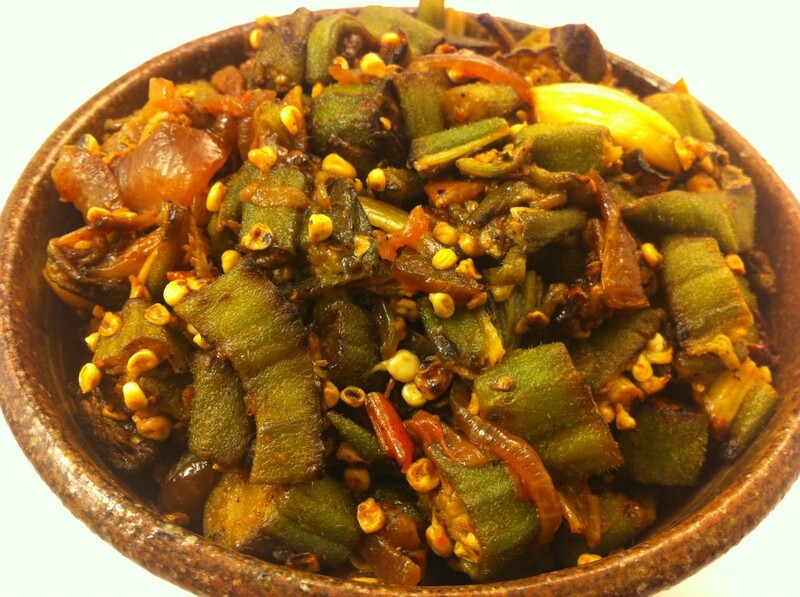 One of my favorite vegetables is bhindi or okra. Some people are off put by the slight sliminess of okra, but I love it! Okra is used a lot in Indian cooking and in the U.S. in the South. This recipe for bhindi masala is how I like it best, dry. Okra takes quite a while to cook, therefore in order to make it without burning the onions and spices, I cook it in a little oil by itself first to get it soft. Then I make the spices and onions separately and add the mostly cooked okra back in. Whenever I cook okra I get so sad because it cooks down so much and I always wish we had more! Me and my husband ate this with dal tadka that I’ll post soon and it was just enough for the two of us. Heat oil in a wok over high heat and cook okra stirring often until the okra is tender. Remove okra from pan (or use another pan), heat oil and add jeera. Once the jeera browns, add the onions and saute until brown, adding the garlic part way through cooking. Add the tomatoes, turmeric, chili powder, coriander, garam masala and amchur powder, and cook until the tomatoes get all mushy. Add the okra to this mixture, add salt, and cook until all the flavors mix up.